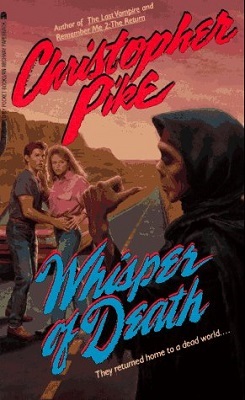 Like a lot of Christopher Pike books, Whisper of Death is not a particularly long book to read. In fact, it’s only about 176 pages long and that count includes a sample chapter of Pike’s book Master of Murder. The main story is told in just 160 pages and I must admit that it took forty of those pages before I became remotely interested in what was happening in the book. The central characters in Whisper of Death are two high school students, Roxanne and Pepper, and the first quarter of the book concentrates on how they meet and fall in love, and how their young and careless love leads to an unplanned pregnancy. When her doctor confirms Roxanne’s worst fears she is prepared to consider having the baby, but Pepper is not keen on the idea and offers to pay for an abortion. Roxanne goes along with the decision and she and Pepper head off to the abortion clinic in the next town. I found none of this interesting and did not particularly like either of the characters, but once this overly-long introduction was out of the way the story managed to hook me in. While Roxanne is driving back home, and Pepper is sleeping peacefully in the passenger seat, she notices a red-haired hitchhiker at the side of the road. The hitchhiker disappears though, and it happens so fast that Roxanne thinks that the red-head was just a trick of the light. Then when she stops for gas she finds the station deserted and wakes up Pepper, who goes to investigate. He finds no signs of life. When Roxanne arrives home her father is not there. But that is okay because he is lorry driver and she never expected him to be home anyway. She did expect her expensive new radio to work though. It doesn’t. All it picks up is static and that is not okay at all. Just to add an extra touch of weird to the situation, the TV isn’t working either and, although Roxanne can get a dial tone on the phone, that is all that she can get—nobody she calls is picking up the phone. Feeling spooked, Roxanne begins knocking on her neighbours’ doors. No one is home: the small desert town of Salem, Arizona is deserted and, until a justifiably confused Pepper finds her, Roxane is alone. “Where is everyone?” he asks and it’s a good question. The couple begins to explore Salem and eventually find three of their friends from school: Stan, who is very fat and very bright and used to coach Roxanne with her algebra; Helter, who was the school’s wannabe-bad dude, and Leslie Belle, who was the School’s designated eye-candy. Once the gang are all together they compare stories and Stan—who really is the brains of the outfit—helps them to piece things together. It isn’t long before he realizes the one thing they all have in common is a girl called Betty Sue. They all knew Betty Sue reasonably well, it seems, and yet none of them are keen to say just how well they knew her. But how could Betty Sue be behind the strange situation they are in? Betty Sue is toast; she doused herself in gasoline and then got busy with some matches. This section of the story is very interesting and, at this point, I couldn’t put the book down. I liked the character of Stan straight away and although the story is written in the first person—Roxanne’s viewpoint—once he arrived on the scene, Stan was the man as far as I was concerned. For a long time it remains a mystery as to what has happened to the inhabitants of Salem, but when the gang visit Betty Sue’s house they find some stories, written by the dead girl, and each member of the group has a starring role in his or her own story. Things get even stranger from then on in and one by one they start to meet with unfortunate ends that are not dissimilar to those mentioned in Betty Sue’s stories. As I stated earlier in this review, I didn’t enjoy the beginning of Whisper of Death, but I loved the middle of it. The last fifteen pages of the book, however, is another story, well another viewpoint anyway—and even another tense, for a while. All through the book, the story is told from Roxanne’s viewpoint, in the first person and the past tense. Suddenly it changes to present tense and then—before I even had time to get used to that change—it changes again. Pepper becomes the viewpoint character and the story is being told in the third person and the past tense. Then—presto-chango—Roxanne returns as the viewpoint character, but the story remains in third person and past tense. Finally (phew! ), Pepper is the viewpoint character. That’s an awful lot of changing about between characters and viewpoints and tenses! Especially in such a few pages. It was more annoying than confusing and the ending just did not work for me. I felt let down. Having said that, overall, I did enjoy reading Whisper of Death because the character of Stan and everything that happens in the middle of the book compensates enough for the rest of the book to make my time spent with it seem worthwhile.